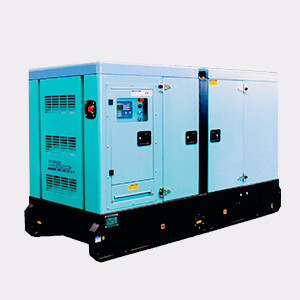 Low noise gensets are manufactured by adopting international advanced technology of generating sets. The gensets we manufactured comply with national standards GB/T2820-1997 or GB12786-91 and also have been put into the market. This series of gensets have significant low noise performace, multi-layer shieding impedance mismatch type acoustic shield, which greatly reduce the influence of noise on users. Large capacity oil burner, quick opening cover plate, and easy maintenance characteristics. 2. The box body is detachable structure, it is made of steel plate, and the surface is coated with high performance antirust paint; meanwhile, it is with noise reduction and rainproof function. 3. The inside of the boby adopts multilayer barrier impedance mismatch noise elimination structure and built in large impedance silencer. 4. The box body structure design is reasonable; a large capacity oil tank is arranged inside the body; at the same time, two inspection doors are arranged at the left and right side of the body in order to facilitate the genset troubleshooting. 5. At the same time, the observation window and the emergency stop button are set on the box body so as to observe the running state of the genset as well as stop the machine at the fastest speed in case of emergency so as to avoid damage to the genset.